30 inch rangetops are pretty easy to compare. Seriously. 30 inch is about high output, low simmer and quality (at Yale, it’s about low service after purchase). You do not have to worry about comparing, grills, griddles or frenchtops like a 36 or 48 inch rangetop. First, we will look at rangetops vs. cooktops and then the best brands to consider. 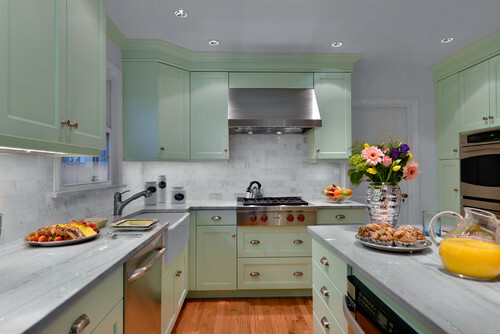 If you are wondering the differences between rangetops and cooktops, it's really location of controls. The cooktop has the controls on the top whereas the rangetop has the controls on the front. This is significant for planning and installation. Rangetops will offer more surface area, as well as higher power burners and a lower temperature range as well. However, cooktops now have high output on 1 or 2 burners and simmer as well. They are also less expensive. Let’s compare some of the best 30 inch rangetops. 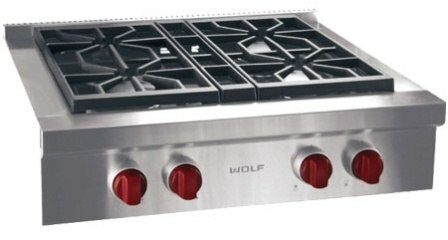 Wolf is a family owned American company with a focus solely on cooking products. They offer a 2 year warranty. Wolf is not only a great quality built product but has definitely made it to the top of most people’s “wish list” as buzz words for resale as well. It has the signature red knobs (you can buy black or stainless as well). Their 30 Inch Rangetop, offers 4 sealed duel stacked burners; Wolf’s signature duel stack burner allows for a consistent both and low temperature range on all burners. On high, it will light the outer ring, and on low, the lower ring. The lower ring of flame sits right underneath the burner cap, acting as a built in simmer plate allowing for very even heat distribution without cold spots. Three of the burners will offer a high output of 15,000 BTU as well has a low simmer of 950 BTU. The left back burner has a 9,200 BTU high output and as well as a low simmer burner at 325 degrees. The Wolf Rangetop is ordered model specific Natural Gas or Liquid Propane. The advantage is NO loss of BTU power with LP. Most other brands lose about 15-20% of their output. Wolf when paired with Subzero will offer an incentive for free counter top appliances. Miele is a family owned German company. Professional cooking products is very new (as of 2015) to Miele. However, they have manufactured cooktops for years. Miele has always been the least serviced brand we sell. A big part in that is their quality control. They manufacture all the components as well as the final products in one factory in Germany and test every single unit. Their rangetops will offer a 1 year warranty. 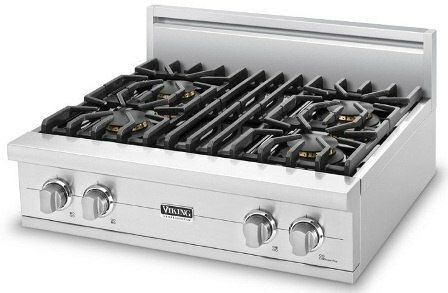 It offers 3 burners with a high BTU of 19,500 and a simmer to 1000 BTU, as well as 1 burner with a 12,500 BTU with a 500 degree simmer. The stainless knobs are substantial and are back lit with LED lighting, adding a nice touch.In addition the front stainless bezel is touch proof stainless. Just like the Wolf, the Miele rangetop is ordered model specific so there is no loss in power when converting to liquid propane. Miele will offer money towards a dishwasher with the purchase of any of their qualifying rangetops, wall ovens and hood vents. Viking is an American company based out of Mississippi. We currently don’t sell Viking due to certain product service issues, but it is a great brand. Viking offers a 3 year warranty. This unit also offers four sealed brass burners. The front right, reaches a high output of 18,5000 BTU, and the rest are 15,000. All of the burners will simmer, however Viking does not publish the lower temperature range. The Viking is ordered in Natural Gas and if propane is needed, there is a conversion kit that needs to be purchased. Thermador was the first American premium appliance manufacturer and remains one of the top brands in the appliance industry. Thermador is a German company yet made in the US. The Thermador Corporation was acquired by the multinational BSH Company in 1998. Thermador is now the premium line in Bosch’s portfolio and is also one of the most reliable brands at Yale. Their rangetops offer a 2 year warranty. What I like a about this range top is that all four burners have the same controls. All sealed burners have a high 18,000 BTU and a low of 350. The back left burner will have an “ultra low” simmer of 100 BTU . In addition their signature star shaped brass burners allows for more surface coverage with pans, whether small or large, with no cold spots. These burners are also raised closer to the grate for less emission loss. It also allows for easy clean up vs. the nooks and crannies you’d typically see on a traditional round burner. Thermador’s rangetops are ordered in natural gas and like Viking are converted in the field with a kit. There is a power loss of roughly 20%. Thermador offers a full range of products with some great rebates like free dishwashers and hoods with qualifying purchases. Thermador is a great rangetop with good power and the best simmer. I like the star burner and general cleanability. However, if you have liquid propane you will lose some power on the burners as well as with Viking, making the Miele and Wolf appealing as they are ordered gas specific with no loss of BTU. Miele will offer a very high output surface great for boiling, searing and wok cooking. However they do not actively publish their lower simmer temperatures. Their LED lights and touch proof stainless are also appealing. Viking offers the best warranty, and in the past it’s been proven to be necessary. Hopefully their manufacturing process improves. It’s not the rangetop as itself but the other products. Wolf will be a happy medium between the two offering a high and low simmer that gets the job done with their duel stacked burners. They also have a solid reputation for product sustainability and of course their signature red knobs. All four of these brands will offer you some great features. You are probably not looking for just a 30 inch rangetop. I would look at the whole kitchen for rebate possibilities. Get The Yale Professional Cooking Buying Guide with features, specs and inside tips to all the brands like Wolf, Miele, Viking, Thermador, GE Monogram, Dacor and more. Well over 100,000 people have read a Yale Guide. Neil Katz has been in appliance sales at Yale for over 25 years. Neil spends time following the Sox and Patriots and watching the stock market.